Stormwater detention basins are relatively large, manmade depressions that capture runoff from rainwater and melting snow. The purpose of these basins is to detain runoff from large storm events and hold it for a short period before discharging to a neighboring stream. Traditionally, stormwater basins are planted only with grass and mown frequently, offering little runoff absorption, limited stormwater velocity control, and no filtering of stormwater pollutants. Some of these pollutants include nutrients, pesticides, grease and other engine fluids, bacteria, chemicals, and sediment. Because of the high velocity of water exiting from these basins, stream bank erosion is a common problem downstream of basin discharges. To address the shortcomings of traditional stormwater basins, land managers are learning about and implementing basin retrofits. In an existing traditional basin, a retrofit can be as simple as planting native vegetation, trees, and shrubs to absorb and filter runoff. Berms can be installed to redirect and slow runoff, allowing it to infiltrate the ground and filter through vegetation longer. Concrete flow channels can be removed, also allowing a longer infiltration and filtering period. 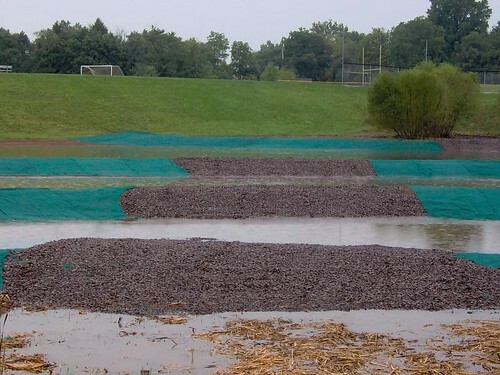 At the Spring-Ford High School, a very large traditional basin of about one acre in size captures runoff from 65 acres of parking lots and playing fields before discharging into the Mingo Creek. 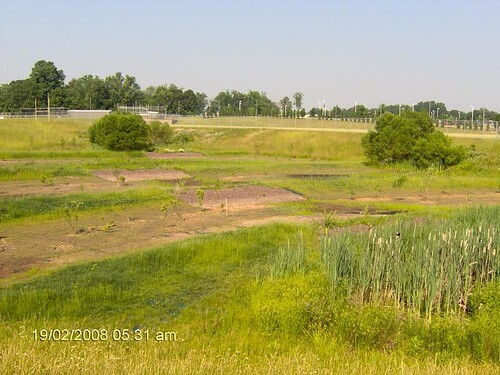 The Montgomery County Conservation District recognized the opportunity to slow and improve the quality of stormwater runoff entering the Mingo Creek by retrofitting the existing basin. After a two year approval and bidding process, the basin was redesigned and berms were installed to slow and redirect water flow, using funds from the Schuylkill Watershed Initiative Grant. 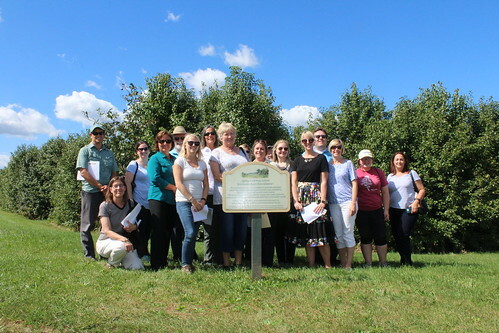 With help from the school’s environmental science students, hundreds of native trees and shrubs were planted and water quality monitoring was conducted. Seeds were spread to stabilize the basin floor and later reseeded to encourage more growth. 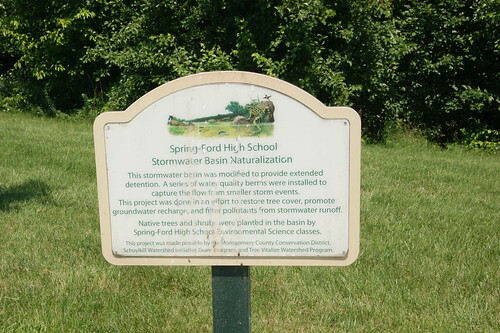 With new awareness of the environmental impact of stormwater runoff from their school, students have taken ownership of the formerly mown-grass basin, maintaining it as needed and enjoying hands-on environmental science educational opportunities. 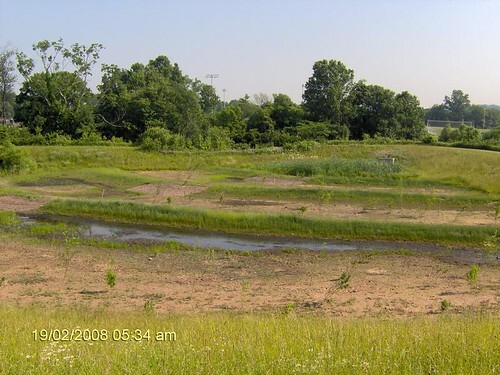 Projects like the Spring-Ford basin retrofit serve as a model for land managers to consider in their efforts to improve stormwater management on their properties.